Feel at home while on vacation in this family friendly home with hot tub and two master suites, plus two additional bedrooms! This centrally located in South Lake Tahoe is perfect for visiting Heavenly Mountain Ski Resort, casinos, beach and hiking. LOCATION! LOCATION! LOCATION! 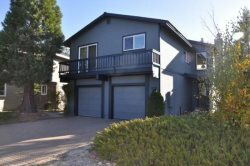 This home is centrally located between casinos, Heavenly Ski Resort and beaches in a safe and highly desired neighborhood. It's only a 5 minute drive to any attraction. You can easily bike to the beach in the summer and take a $5 Uber ride in the winter. The home has an empty forested lot next to it for added privacy. It's not often you find an affordable home of this size. The great room concept allows the entire group to be together with a large deck off the kitchen adding to the living space in the summer. The living room has all new furniture purchased at the end of 2016. A great sectional and huge 60 inch TV along with 2 arm chairs make this space big enough for movie nights. The kitchen has all new cookware, plates, silverware, coffee pot, and toaster so your family will be one of the first to cook with them! Lower deck has a hot tub and a brand new gas BBQ perfect for all months in Tahoe. All 4 bedrooms are located on the upper level with two master suites and two additional bedrooms. You will sleep sound knowing all bedrooms are spacious with new mattresses and bedding. Both master suites have access to an upper deck off the back of the home. The fenced yard adds greater security for families with little ones who want to play out back while the adults soak in the hot tub. As you can see, the owners were kind enough to buy all new items for this home so it would be fresh and ready to go for your family's vacation! Parking is maximum of 4 cars, Tahoe Police will fine guests with more than 4 cars. "Everything we could have possibly needed was available, clean and ready to go."